New research attempts to define where and how the SCV's early residents lived. 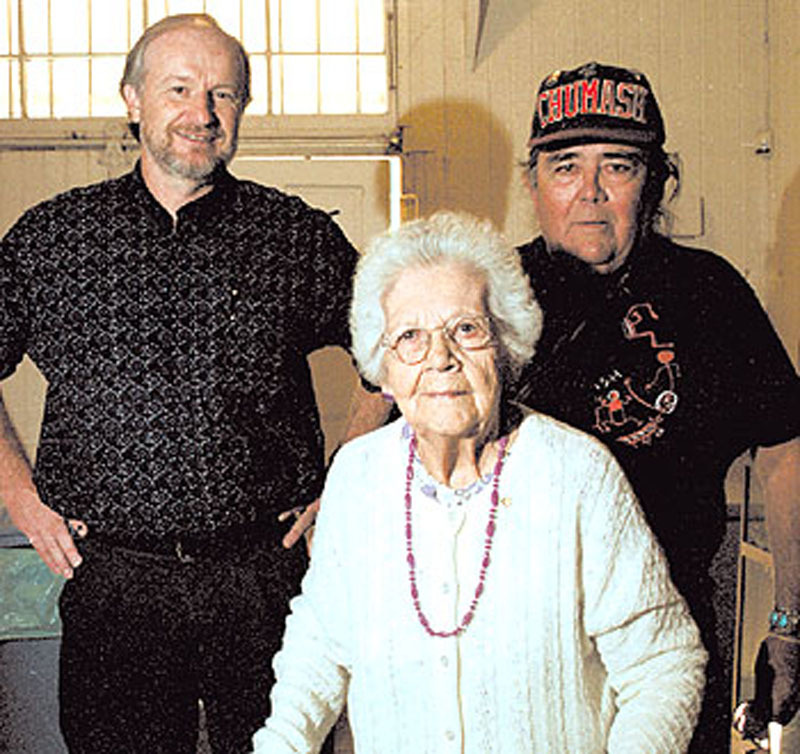 Dr. John Johnson (left) of the Santa Barbara Museum traced the heritage of 95-year-old Newhall resident Lyda Manriquez (center) and her nephew, Charlie Cooke (right). They are of mixed Tataviam, Chumash, Kitanemuk and Tongva ancestry. Photo: Nathan Caswell/The Signal. A renewed interest in the life and times of a long-gone Native American tribe of the Santa Clarita watershed, the Tataviam, seems to be sweeping through the archaeological community in Southern California. Since the dawn of the century, numerous research studies have been conducted about the Tataviam — yet none has managed to shed much light on several fundamental questions about their history, culture or territory. Southland scholars picked up the thread of research again in the past few months. Their goal, though operating independently from one another, is to answer those questions. "(The Tataviam) are the least known group of Native Americans in all of California," said Dr. John Johnson, curator of anthropology at the Santa Barbara Museum of Natural History. They came, they lived, they disappeared. The Tataviam came, unannounced and unexpected, around A.D. 450 and settled in the Santa Clara River Valley. They lived quietly, peacefully and in harmony with nature and their neighbors. Then, as quietly as they came, they disappeared. They were absorbed into the first Spanish missions, and within a century they were almost completely eradicated from the pages of the history books. It is not even known what they called themselves. No early explorer or anthropologist ever asked a Tataviam what the tribe's name was in their own language. Their Kitanemuk relatives in the Antelope Valley called them "Tataviam," which roughly translates to "people of the southern slopes." Most of the Tataviam territory lies between 1,500 and 3,000 feet above sea level. They built their villages on south-facing slopes of hills and mountains for maximum sun exposure, thus the name. But their neighbors to the west, the Chumash, referred to them as "Alliklik," a derogatory term meaning "grunters" or "stammerers." The Chumash name for them mimicked what they considered the strange sounds of the Tataviam language. John Peabody Harrington of the Smithsonian Institution and Alfred Kroeber of University of California, Berkeley recorded both names and several variations thereof (which all meant the same in different dialects) between 1907 and 1925. In the early 1930s, anthropologists from the Peabody Museum of American Ethnology at Harvard University came to research the local tribe, whose artifacts were on display at their museum. It was these men who made "Alliklik" the semi-official name. The name stuck for decades, until concerned Native Americans in the 1970s popped the inevitable question: Did the scientists know what Alliklik actually meant? They explained it wasn't a friendly term, so they provided the alternative — Tataviam. The Tataviam were not California natives in the beginning. A few Shoshone bands began migrating westward from the Great Plains in search of more abundant food sources and better climate, during a particularly bad drought period 3,500 years ago. Dr. Charles Rozaire, a legendary California archeologist, published his "Shoshone Wedge" theory more than half a century ago, postulating that they entered California in a wedge-shaped pattern and spread about the land. Rozaire wrote that the Tataviam were linguistically related to the Shoshone and spoke a Takic dialect of the Uto-Aztecan language group. "Archeological data suggest that the Tataviam began to differentiate from other southern California Takic speakers around 1000 B.C.," states a 1978 article by archeologists Chester King and Thomas C. Blackburn. In A.D. 450, a group of these Takic-speaking people reached the Santa Clarita river drainage and settled in about 25 semi-permanent villages. Archeologists have located several of these village sites, such as Etseng on Piru Creek, Pi'ing under today's Castaic Lake, Cueccho in the Tejon area and more. However, the places believed to have been the biggest encampments, such as Tochonanga in the Newhall area and Chaguayabit, probably at Castaic Junction, have not yet been discovered. Johnson, of the Santa Barbara museum, questions the existence of a village called Nuhubit, which appears on a map drawn by Richard F. Van Valkenburgh in 1937. According to Johnson, Van Valkenburgh "was a fine archaeologist but was definitely no writer. He didn't always record his data correctly." Their territory spanned from Piru to the west, Newhall to the south and the Liebre Mountains to the north. The eastern boundary of the Tataviam has not yet been determined. To date, neither the first Spanish explorers' accounts, nor the early anthropologists' research — not even recent archeological data — could define the line separating the territories of the Tataviam and the Kitanemuk, another Takic-speaking group. And that is exactly what appeals to Dr. Joseph Eisenlauer, associate professor of anthropology at Los Angeles Pierce College, who will run an archeology field class beginning next semester. A main objective of the class will be to try to determine the exact boundary. Eisenlauer said it was "by pure accident" that he met U.S. Forest Service archaeologist Michael McIntyre, who suggested that Eisenlauer's class study an area in the Angeles National Forest. An archeologist by training, Eisenlauer said his students plan to work on a piece of national forest land near Acton. It is slated to be a long-term comprehensive field program that will provide Pierce students hands-on training in archeology. Eisenlauer actually has a much bigger agenda. In addition to the quest for the eastern boundary, the field class hopes to verify Tataviam settlement patterns and population densities; plot the distribution and seasonality of food resources — when and what the Tataviam extracted from the canyons; locate the raw materials they used; and clarify trade links with neighboring and distant tribal groups. Two of Eisenlauer's current anthropology classes are researching the Tataviam, their history, culture and natural environment. "We are gearing up to become Tataviam experts," Eisenlauer said. He said the agreement between Pierce and the Forest Service is "on paper" and should be approved by the Los Angeles Community College District in a few weeks. Eisenlauer's students don't have much material to draw from. Gaspar de Portolá encountered the friendly Tataviam while searching for mission sites in 1769. And while the New World was about to gain independence from the old, in 1776 another Spanish padre, Father Francisco de Garcés, set out on a discovery journey from Yuma to Monterey. Garcés also met these Indians and in his diary recorded their "particular meekness and affability." The records of the early Spanish travelers are important historically but are rather vague and often confusing anthropologically. Harrington's, Kroeber's and several other ethnologists' reports from the late 19th to early 20th century are more abundant — but not much more accurate than the Spanish notes. Regrettably, these early anthropologists failed to record much of the information that was still available to them at the time on Tataviam costumes, legends, language and history. They could have talked to full-blooded Tataviam Indians, but the people they could have interviewed died before the scientists got around to recording their memories and knowledge. The result is a huge gap in Tataviam tribal history. Thus, mission records, and information gleaned from digging in the ground, is where recent scholars have looked for answers. Archeologists David Whitley and Joseph Simon are recording known and newly discovered villages and other living floor sites, and hope to add them to the National Register of Historic Places. They are concentrating their search in the Acton area, where numerous Tataviam sites have been identified. Whitley and Simon are not new to Tataviam research. They were contract archeologists for The Newhall Land and Farming Co.'s Newhall Ranch project in 1993, preparing the cultural-paleontological section of the project's environmental impact report. In other words, Newhall Land hired them to appraise possible archeological sites at the future development site. To their surprise, Whitley and Simon found only eight spots in the 12,000-acre Newhall Ranch area with traces of early human occupation. Only three of them were actual campsites. Johnson of Santa Barbara has researched the Tataviam for more than 20 years. His interest piqued in 1977 while working as a staff archeologist for the Los Padres National Forest. "At that time several studies were published that pointed out how little we knew about the Tataviam," he said. Johnson collected ethnohistoric and archeological information for the Forest Service, and later researched the mission records and Harrington's notes for a different project. He helped create a database for six of the missions in California and came to know many local Native Americans, aiding them in reconstructing their family trees based on mission records. Johnson specializes in the Indians of Southern California, using "archival sources to reconstruct village names and locations, population size, marriage and family patterns and the histories of California Indian communities," he said. Guest speaker at the SCV Historical Society's October meeting, Johnson gave a comprehensive account of his research of Tataviam history and genealogy and illustrated his lecture with slides of known Tataviam people and sites. Of the 50-or-so attendees at the meeting, four were of Tataviam ancestry. Lyda Manriquez was born in 1905 in Newhall and still remembers quite vividly some of the people and places Johnson mentioned in his talk. It was Johnson who reconstructed Manriquez's family tree through the San Fernando Mission records. During the Spanish mission period, all local tribes were forced to abandon their lands and move to the missions to provide free labor to the padres, in the name of Christianity. Six tribes were uprooted and relocated to San Fernando, one being the Tataviam. Now that they were closer to each other, intermarriage among tribes became the norm at the missions. Thus there were almost no full-blooded Tataviam following the mission period. Both Manriquez and her nephew, Charlie Cooke, are of mixed Chumash, Tataviam, Kitanemuk and Tongva ancestry. "I've always known I had Tataviam blood in me," said Cooke. "My family has lived in the Santa Clarita Valley for generations, and I knew that I was a descendant of one of the six tribes that built the San Fernando Mission." Cooke's family was the first Johnson studied. About 600 Native Americans in the greater Los Angeles area claim Tataviam ancestry, and some are fighting for federal recognition. Most can trace their family trees through mission records. "The problem is that if you can't prove your Native American ancestry through the mission records you don't classify as an Indian in the government's eyes," said Cooke. "That is why (attaining) federal recognition is so difficult." Chester King, another well-known California archeologist, has researched the Tataviam on and off for decades. King has published several works including a study of Vasquez Rocks County Park in 1973. He too has studied mission registers and has "recently been asked to study further in the southern part of the Tataviam territory," he said. Archeologist David Earle of the Lancaster City Museum is another key player in the new research projects. As with Johnson and King, Earle's interest in the Tataviam spans decades. He specializes in locating village sites that were occupied during and after the mission period. "We know of most of them where they are," Earle said. "What I'm doing now is finding the physical location of villages mentioned in the records." Earle is matching up village names in the baptismal registers with actual locations. "One of the key things is being able to locate the villages and align them with the historical records," he said. "Using mission records gives clues to population as well. Based on the number of known villages we can estimate a population of about 500-1,000 Tataviam at the time of European contact. "But we first need to definitively decide how many villages were actually there at the time the Spanish arrived," he said. Earle and Johnson worked together in 1990 on a Tataviam project, Earle supplying the geographical data, Johnson contributing his genealogy studies of the mission records. The renewed attention to the Tataviam sits well with Tom Hale, an Acton resident who is considered the "guardian angel" of Native American history in the area. "I'm very happy and extremely excited about this," said Hale, who admits he is no expert by academic standards. "I'm just an old mountain man who knows a little bit about the history of this watershed." Yet Hale is frequently sought out by archeologists for advice and assistance because he knows the area better than anybody and because he knows a lot about the early inhabitants of the land. "I grew up on Tataviam territory," Hale said of how he developed an interest in the tribe. "We would find artifacts all over the place every day just by plowing the field and so forth." Hale worked for the Department of Commerce's Geodetic Survey from 1961-83. His expertise in geology, topographic surveying and general research is an invaluable tool he uses to locate and save Indian artifacts and sites around Acton. "I am extremely interested in preserving archeological sites," he said. "What we know now is very interesting. But unless we protect these sites, who knows what will be left of them in 50 years? "Everything that was here that supported the Indians way back then" is still there, he said — all the food sources and rock quarries and other natural elements, making it easier to reconstruct early lifestyles. Hale has been gathering as much information about the Tataviam as possible. He noted that several scientific studies had been conducted, but "nobody ever tried to put these together." "And that is what tickles me most about Pierce College's project," he said. "What their group is attempting to accomplish is going to bring even more attention to the Tataviam." Sadly, the history of the Tataviam is also a history of lost opportunities. The last full-blooded Tataviam, Juan José Fustero, died in 1921, and the language of his small tribe diminished even before him. The opportunity to study Tataviam culture and language first-hand was lost forever. Even the 600 Native Americans who consider themselves Tataviam descendants are, in fact, of mixed ancestry. Had the first Spanish explorers recorded their encounters with the local tribes in more detail, or had anthropologists of the early 1900s done more thorough research while there were still full-blooded Indians around, considerably more would be known. But these data are not available ... so it is up to present and future archeologists to uncover the secrets of the Tataviam.